Is it me or is Easter turning into Christmas from a consumer point of view? The build-up; the displays adorning shop windows; the Easter baskets akin to Christmas stockings. And the thing is, I can’t help but jump on the bandwagon. The kids each have an Easter basket that they put out on Easter Saturday for the Easter bunny to leave their presents in, just like they would a stocking, and I dutifully fill them, just as we do their Christmas stockings. I’ve got no idea where the concept came from, but it’s become a tradition in our house – and also quite a good bribe in the run up to Easter. 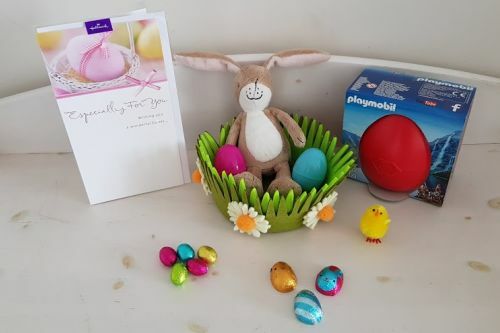 There are now three baskets to produce – one each for the older two and one for the baby – and the main aim of the game is not to break the bank and not to stuff them to the gunnels full of chocolate. So what am I putting in them? I’m a big fan of Playmobil because of its longevity – the kids literally play with it all year round (they’re still playing with the contents of their Playmobil advent calendar well into March). 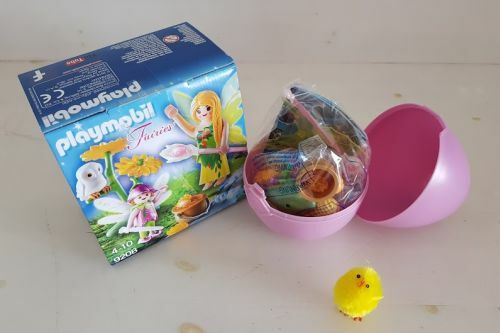 Playmobil’s Easter offering includes a five-strong range of eggs containing build-it-yourself toys including fairies with a magic cauldron, Vikings with a shield and a vet with foals. At £6.99 I think they’re an absolute bargain – you can easily spend that on a chocolate egg which is gone in less than a day. The Easter offering from our favourite stationery shop features a traditional cardboard egg carton containing six coloured plastic eggs. 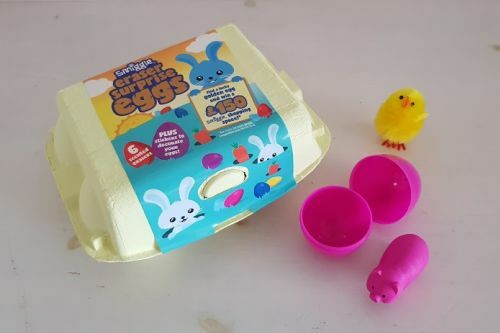 Inside each egg is a collectable scented eraser and stickers to decorate the egg. As a mum of three this is perfect because I can buy one carton and split the contents between the kids, saving some pennies in the process. 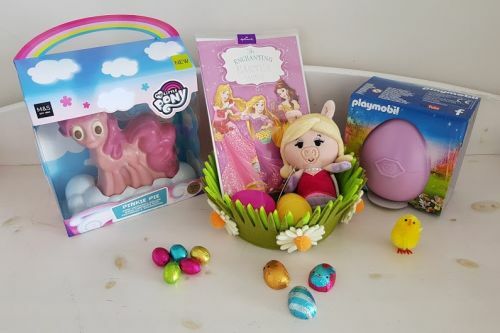 Plus if you find a golden coloured egg you can win a £150 Smiggle shopping spree. Call me old fashioned but I rather like the idea of giving cards at Easter. 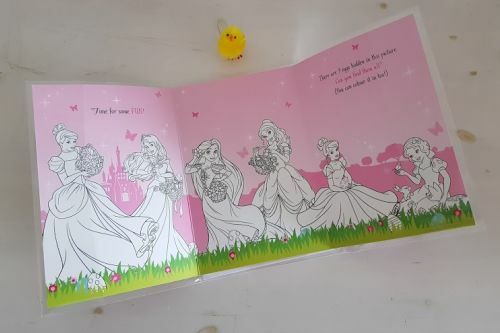 Traditionally I always sent one to my Grannies at Easter, but neither of them are with us anymore and I thought that was that until I discovered Hallmark do a great range, including this Disney Princess colouring-in fold-out card featuring hidden Easter eggs. From the Easter bunny, of course. 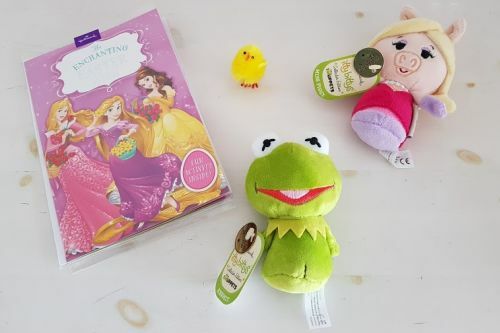 Kermit the Frog and Miss Piggy are the latest addition to the itty bittys line-up – the kids love them and they’re ideal Easter basket fillers. 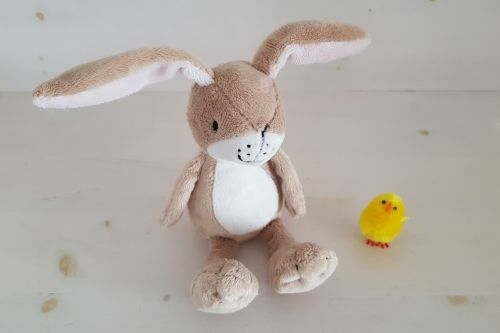 Perfect for babies, the Guess How Much I Love You little nutbrown hare rattle is super soft and squishy and a great alternative to chocolate. This one’s for Littlest B as she’s too small for chocolate, and features beads inside the tummy which rattle when shaken. We give each of the kids a ‘main’ egg from us and I love Marks and Spencer’s range of character eggs. 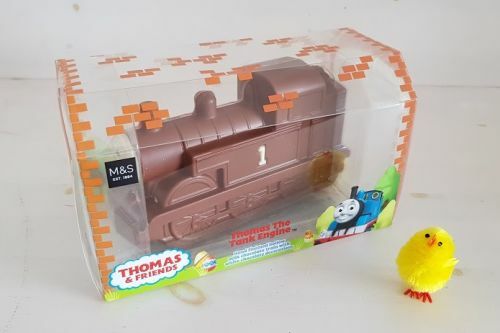 New for 2018 is My Little Pony’s Pinkie Pie (I can’t wait to see BB’s face) and back for another year is Thomas The Tank Engine, both made from ‘hand finished’ milk chocolate. Finally I throw in a handful of foil wrapped eggs and animals because they’re guaranteed to want to start scoffing before breakfast, and this way you can limit or at least manage the amount they’re eating. M&S do an eye-catching range including bunnies and bobtails, all of which are on offer for 3 for 2. So that’s what’s going into our Easter baskets this year. Do you do Easter baskets in your house? What do you put in yours? We were sent the Playmobil eggs, Smiggle Easter egg carton, Hallmark Easter cards and Muppets itty bittys free of charge in exchange for this post. As always all opinions are my own and based on my own honest experience. I would never endorse a product I don’t truly believe in. hahaha! I have jumped on the Easter bandwagon too. My girls have got so much this year for Easter. Those Playmobil eggs look fantastic. I keep meaning to get my youngest one but I never quite get around to it. 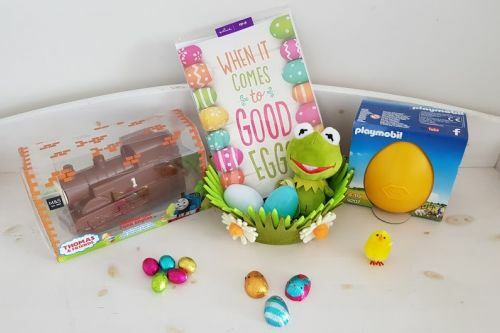 I need to add things for my son’s basket I’ve got him a playmobil egg they look great fun and such a great idea other than chocolate. 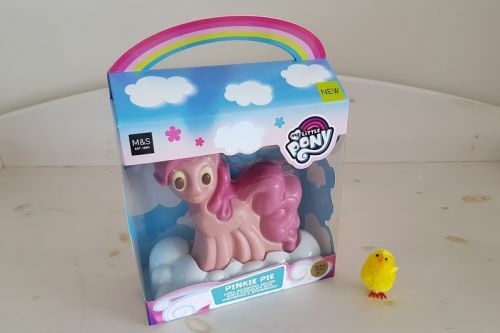 What fantastic Easter basket your kids are getting. Love the chocolate bit! 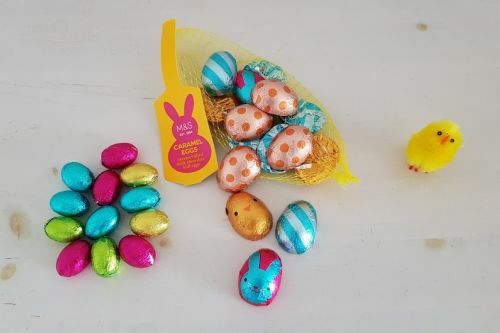 So adorable…I am a total fail at easter and always grab the girls a lindt bunny…but we get SOOOO many eggs it’s a joke. I threw two away this morning…from last easter!